These are a pair of Crocs with what looks like a bunch of rocks glued onto them. It appears that Crocs are messing with our minds. The Crocs you’re looking at above—which resemble something Gene from Bob’s Burgers might make as a last-minute craft project—are the work of designer Christopher Kane, who outfitted models in these unsightly hoof contraptions today as part of his spring 2017 collection during London Fashion Week. Son. These are ROCKS on CROCS!!! And Crocs have been trying to be chic for years now. We already did this! How many times do we have to reject you, BUGABOO, before you get the point? This feels a bit like Groundhog Day. 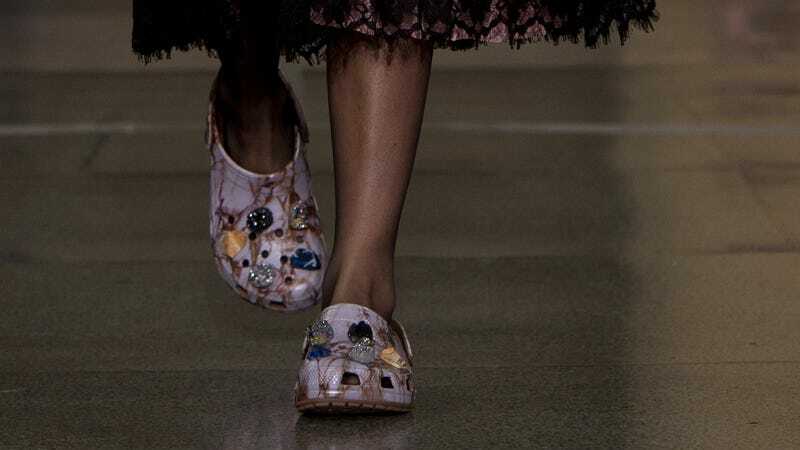 These rock Crocs won’t be available to purchase in stores, but consumers will be able to buy a pair for over $150 (much more than the normal pricing) via “a very select list of stores that Christopher Kane currently distributes to,” according to Poole. Are you coming around yet? Well. Confession. The Crocs below aren’t as atrocious as the rest (they look like bedazzled Hunter rain booties) and I know many people that would wear them. Am I alright?